Not to be confused with Pisces (astrology). Pisces is a constellation of the zodiac. Its name is the Latin plural for fish. It lies between Aquarius to the west and Aries to the east. 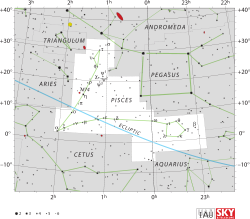 The ecliptic and the celestial equator intersect within this constellation and in Virgo. Its symbol is (Unicode ♓). Best visible at 21:00 (9 p.m.) during the month of November. 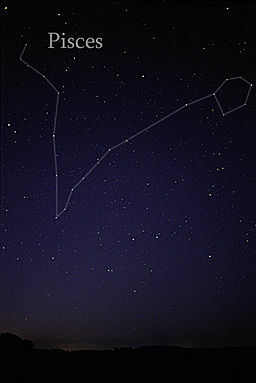 The constellation Pisces as it can be seen by naked eye. The vernal equinox is currently located in Pisces, due south of ω Psc, and, due to precession, slowly drifting below the western fish towards Aquarius. Van Maanen's Star, at 12.35 magnitude, is located in this constellation, along with others, such as HD 222410, at 7.45 magnitude. Gamma Piscium (γ Psc), 320 lightyears, apparent magnitude 12.078. M74 is a loosely wound (type Sc) spiral galaxy in Pisces, found at a distance of 30 million light years (redshift 0.0022). It has many clusters of young stars and the associated nebulae, showing extensive regions of star formation. It was discovered by Pierre Méchain, a French astronomer, in 1780. A type II-P supernova was discovered in the outer regions of M74 by Robert Evans in June 2003; the star that underwent the supernova was later identified as a red supergiant with a mass of 8 solar masses. NGC 488 is an isolated face-on prototypical spiral galaxy. NGC 520 is a pair of colliding galaxies located 90 million lightyears away. CL 0024+1654 is a massive galaxy cluster that lenses the galaxy behind it, creating arc-shaped images of the background galaxy. The cluster is primarily made up of yellow elliptical and spiral galaxies, at a distance of 3.6 billion light-years from Earth (redshift 0.4), half as far away as the background galaxy, which is at a distance of 5.7 billion light-years (redshift 1.67). 3C 31 is an active galaxy and radio source in Perseus located at a distance of 237 million light-years from Earth (redshift 0.0173). Its jets, caused by the supermassive black hole at its center, extend several million light-years in both directions, making them some of the largest objects in the universe. Pisces originates from some composition of the Babylonian constellations Šinunutu4 "the great swallow" in current western Pisces, and Anunitum the "Lady of the Heaven", at the place of the northern fish. In the first-millennium BC texts known as the Astronomical Diaries, part of the constellation was also called DU.NU.NU (Rikis-nu.mi, "the fish cord or ribbon"). Pisces is associated with Aphrodite and Eros, who escaped from the monster Typhon by leaping into the sea and transforming themselves into fish. In order not to lose each other, they tied themselves together with rope. The Romans adopted the Greek legend, with Venus and Cupid acting as the counterparts for Aphrodite and Eros. The knot of the rope is marked by Alpha Piscium (α Psc), also called Al-Rischa ("the cord" in Arabic). Piscis Boreus (the North Fish): σ – 68 – 65 – 67 – ψ1 – ψ2 – ψ3 – χ – φ – υ – 91 – τ – 82 – 78 Psc. Linum Boreum (the North Cord): χ – ρ,94 – VX(97) – η – π – ο – α Psc. Linum Austrinum (the South Cord): α – ξ – ν – μ – ζ – ε – δ – 41 – 35 – ω Psc. Piscis Austrinus (the South Fish): ω – ι – θ – 7 – β – 5 – κ,9 – λ – TX(19) Psc. 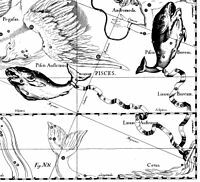 Be aware that Piscis Austrinus more often refers to a separate constellation in its own right. Both (smaller) fish depicted in Pisces are said to be the offspring of the one greater fish in the constellation Piscis Austrinus. 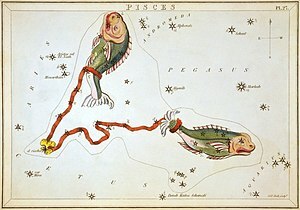 In 1754, the astronomer John Hill proposed to treat part of Pisces as a separate constellation, called Testudo (the Turtle) 24 – 27 – YY(30) – 33 – 29 Psc., centred a natural but faint asterism in which the star 20 Psc is intended to be the head of the turtle. However the proposal was largely neglected by other astronomers with the exception of Admiral Smyth, who mentioned it in his book The Bedford Catalogue, and it is now obsolete. The Fishes are also associated with the German legend of Antenteh, who owned just a tub and a crude cabin when he met a magical fish. They offered him a wish, which he refused. However, his wife begged him to return to the fish and ask for a beautiful furnished home. This wish was granted, but her desires were not satisfied. She then asked to be a queen and have a palace, but when she asked to become a goddess, the fish became angry and took the palace and home, leaving the couple with the tub and cabin once again. The tub in the story is sometimes recognized as the Great Square of Pegasus. The stars of Pisces were incorporated into several constellations in Chinese astronomy. Wai-ping ("Outer Enclosure") was a fence that kept a pig farmer from falling into the marshes and kept the pigs where they belonged. It was represented by Alpha, Delta, Epsilon, Zeta, Mu, Nu, and Xi Piscium. The marshes were represented by the four stars designated Phi Ceti. The northern fish of Pisces was a part of the House of the Sandal, Koui-siou. Pisces is a dim constellation located next to Aquarius, and Aries. While the astrological sign Pisces per definition runs from ecliptical longitude 330° to 0, this position is now mostly covered by the constellation of Aquarius, due to the precession from when the constellation and the sign coincided. ^ a b c d "Naming Stars". IAU.org. Retrieved 8 August 2018. ^ a b c Wilkins, Jamie; Dunn, Robert (2006). 300 Astronomical Objects: A Visual Reference to the Universe (1st ed.). Buffalo, New York: Firefly Books. ISBN 978-1-55407-175-3. ^ P.K. Chen, A Constellation Album: Stars and Mythology of the Night Sky, p. 94 (2007, ISBN 978-1931559386). ^ a b c Staal 1988, pp. 45–47. ^ Allen, R. H. (1963). Star Names: Their Lore and Meaning (Reprint ed.). New York, NY: Dover Publications Inc. p. 163 342. ISBN 978-0-486-21079-7. Richard Hinckley Allen, Star Names, Their Lore and Legend, New York, Dover: various dates. Staal, Julius D. W. (1988). The New Patterns in the Sky: Myths and Legends of the Stars. The McDonald and Woodward Publishing Company. ISBN 978-0-939923-04-5. Thomas Wm. Hamilton, Useful Star Names, Strategic Books, 2008.